I just wanted to share what has been going on with training these last few weeks as I prepare for Ironman 70.3 California. In the midst of training I have been unable to write new blogs as frequently as I would like. 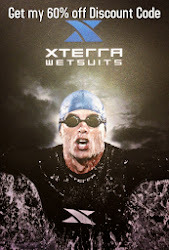 I have grown accustomed to maximizing my daily routine and time to the sport of triathlon. It’s not easy being an age group athlete with a full time job, two kids and a great wife. It’s not uncommon for me these days to be up at 4am pounding the trainer or treadmill. After that early wake up it’s off to work then to another training session. Does it sound like I am complaining? It could be perceived that way but I guess I enjoy the demands of the sport too much to complain. Ironman 70.3 is a few weeks away and I am feeling really fit and strong. I am however, nursing a mysterious heel injury that has slowed me down a bit. I don’t know what it is but I will blame my club foot deformity on this not my “overtraining”. I really have no desire to see a doctor because all he will say is, “You know Tony someone born with club foot should not be doing what you’re doing. Why don’t you just stick with swimming? I recommend you quite running forever, if you don’t your putting yourself at risk.” I would probably end up repsonding with something like, "Blah Blah Blah… then give me a freakin Cortisone shot already!" I have noticed that more pain has become evident this last year. I have been experimenting with all sorts of methods to ease the pain. Some help and some don’t. It’s just an everyday struggle that’s hit or miss. I have tailored my running somewhat and I hate the idea of missing out on a few extra miles. In the last 3 months I have tried several shoes, had my inserts modified, experimented with new pain management tools and feel like nothing has really changed. The only thing that has changed is the pain seems to be increasing more and more daily. I am about two weeks out from the big race and I am looking forward to my “taper” where I can rest my wounded body and allow it to grow strong before race day. I have done all I can to be prepared. I have put in 15-20 hours a week of swim, bike and run. Numerous two a days, a.m. wake up calls and evening runs. I have modified my race training by adding more intense sessions, hard and easy days. I have been practicing a more aggressive recovery plan. I found that ice has become my new friend. As a matter of fact as I write this I have ice packs in the refrigerator at work. I am waiting for my break so I can ice these bad boys before I hit an 8 mile run when I get off… People at work are like, “what are these?” Oh, there for that disabled athlete guy!” It’s funny because I now am the “disabled athlete guy” who brings his training gear with him because I have to sneak in a session before I get home to my second job, being a dad! Some people have asked what my race schedule looks like. So here is my race schedule for the year. Stay tuned for a race update! Sorry about the newer pain...ugh! Not to compare, but I have had cortisone shots in my foot a few times for a neuroma and let me tell you...they are straight from heaven. Practically instant relief! Even if the doctor recommends no more running just go and put up with him to get the shot! Good luck! This is very inspiring to me. I have a corrected left club foot and have recently taken up running. I ran my first half marathon yesterday and am in so much pain today I can barely walk. It has not stopped me, I've signed up for my second next month. I've been looking for other athletes like me to turn to. Others just don't understand. I run because I was told I would never walk, much less be an athlete. I look forward to future post from you. Addie, thank you. I just finished a Half Ironman this weekend (1.2 mile swim-56 mile bike-13.1 mile run) and I am feeling pain beyond believe. In the days following a race of this distance I often question why I am doing this to myself. I woke up this morning and read your comment and it affirmed why I do this. I do it to inspire others with clubfoot. Please never stop pushing yourself to reach your goals. Reach out to other disabled athletes and be an example and insoiration to others. I feel your pain. I have a degenerative injury that does not permit me to run anymore. I have had to give up running all together and now do Aqua Bike events. I have worked on staff with the USAT to help develop more Aqua Bike events across all of the national regions and work to educate race directors and athletes as to the plight of injured and disabled athletes. I am also in a chronic state of pain and have learned how to either live with it or manage it. 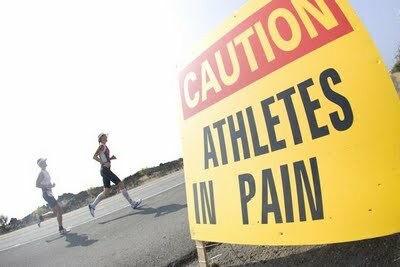 is it possible t get the picture with "athletes in pain" in a higher resolution?